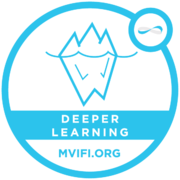 In 2017-18, MVPS faculty and staff read Deeper Learning, an anthology of chapters about deeply engaging and motivating learning that possesses strong ties to learner-centeredness. To earn this novice-level badge, one had to read the Introduction, Chapter 2, and three other chapters of choice. Additionally, the earner posted brief reflections of each chapter, so that others could read the reflection and comment back in some fashion. Reflections included ideas about how one might implement concepts from the chapter. Read Introduction, Chapter 2, and three other chapters in Deeper Learning. Post public reflections on four chapters, including ideas for implementing chapter concepts.